I have a feeling that I’m going to contradict myself several times during this post. 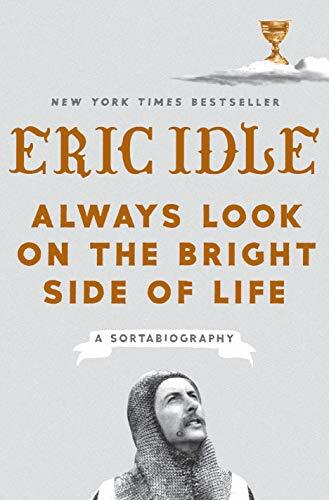 For those who don’t know, Eric Idle is one of the writers and members of Monty Python, so maybe being odd and contradictory is the best way to review this book. Sure, let’s go with that. I found myself laughing uproariously several times during this book, of course. Eric Idle has the gift of stating the saddest things in a way that neither diminishes what happened, or dwells on it. Kind of a like a “Yeah, that sucked, but it’s life” attitude (you’ll see what I mean when you read about what happened to his dad). He’s well aware of his talents, but equally well aware of his faults and finds humor in them. This book both needed to be longer, but could have been condensed. See what I mean about being contradictory? At less than three hundred pages, there’s really not much to the book length-wise, so being longer wouldn’t have been bad IF there was more that could be said. Of course, I also found myself thinking that parts dragged. Some of it read like sitting with someone who suddenly switches from telling you a story to muttering to themselves about it. Eric Idle would be the perfect person to hang out with at Thanksgiving, or during a family reunion: he has the most interesting reminiscences. However, some of that was lost in the writing. I really liked his stories of the random weirdness he got into. Because of that, I wish there was also a book with memories written in collaboration with all the members of Monty Python. That would be epic. Of course, Graham Chapman would have to come back from the dead for that, and who would cheat death just to argue with editors? All in all, the funny parts were hilarious, the little-known tidbits were fascinating, and the rest was just there. Would I recommend it? Ummmm…maybe? It wasn’t a bad way to ring in a new year of reading, but it wasn’t incredible. Interesting. I have the words from the song with this title on my wall to help me out when I have a bad day. I understand your like/dislike of this, it can be a challenging genre. I love this song. Genius! Did you read the book? I’m curious to know what other people think. No I haven’t, this review is the first time that I’ve seen this book. I read biographies occasionally, as you say, there are usually bits of interest, but often not the whole book. I’m trying to read more nonfiction, but I can’t help it: I love fantasy. This has been on my “get to it maybe” list since I first heard about it. I think you solidified its place there.